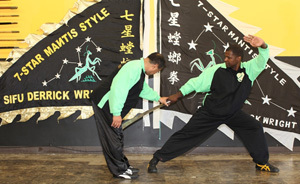 Private training offers students the individual attention to improve their martial arts. 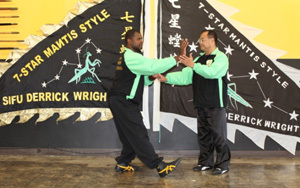 The group class setting at Wright's Kung Fu is effective for teaching students martial arts and has many social and competitive benefits, but private martial arts training can be highly effective in taking you to that next level of perfection. Private training gives students the one-on-one training they need to address some of the details they may have missed, forgotten, or that just needs to be reinforced during the group classes. Not only does private martial arts training help you to build rapport between the instructor and the student, it also helps the instructor learn the personal needs of the individual student. Private training is an excellent way to supplement group classes. We can arrange a time and a place that's covenient for you. Either we can come to you or you can come to us! Call us now at 1-323-875-5449 to schedule your Private Training. Martial Arts is a great way to get in shape, lose weight, learn self defense, and have fun! Tai Chi is another martial art form that is offered to help students improve their physical and mental health. Fitness training helps you lead a healthy and balanced lifestyle.